In medium bowl, mix all ingredients except cucumbers. Cut tapered ends from cucumbers. 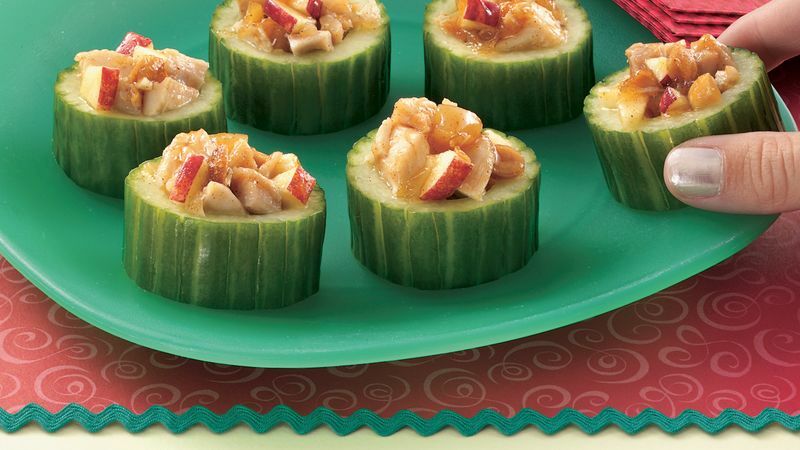 Draw tines of fork lengthwise through cucumber peel to score; cut into 3/4-inch-thick slices. With small melon baller, scoop and discard center portion of each slice; do not go through bottom. Fill each with 1 tablespoon chicken mixture. Seedless cucumbers are also called hothouse or English cucumbers. They are longer and thinner than regular cucumbers, and any seeds are tiny and very tender. The skin is also tender, so they don't require peeling.